I recently went on a road trip to Hot Springs, Arkansas. One of my road trip rules is to find off-the-beaten-path places to eat. I prefer to eat where the locals eat, since they often have the most unique, and tastiest, food. Why eat at a chain place, or, even worse, a fast food window? We hit Texarkana around lunch time and, using the trusty iPhone, we found a place called Bryce’s, a cafeteria which has been around since 1931! 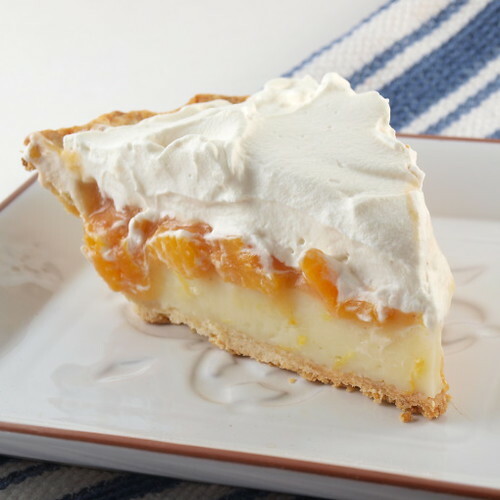 Reviews for Bryce’s were good, and almost all of them said to try the peach pie. Who am I to argue? Their peach pie was lovely! 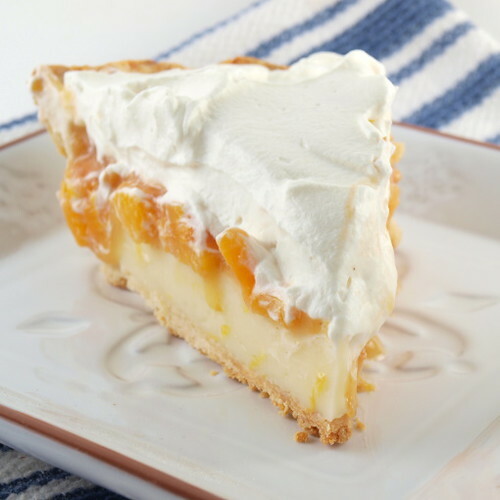 A creamy custard topped with cooked peaches, all inside a flaky crust and topped with whipped cream? How can any of that be bad? Well, when I got home I decided I needed some more of that pie, but I was not going to drive back to Texarkana, so I had to make my own. 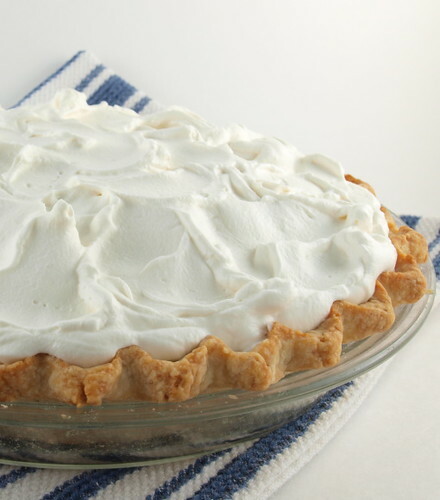 Below is my version, and I am happy to report it may be better than the pie that inspired it. 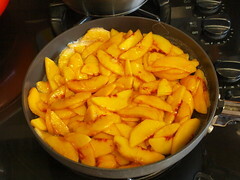 The crust is made with butter only for richness, and I reduced the custard layer so I could have more peaches. 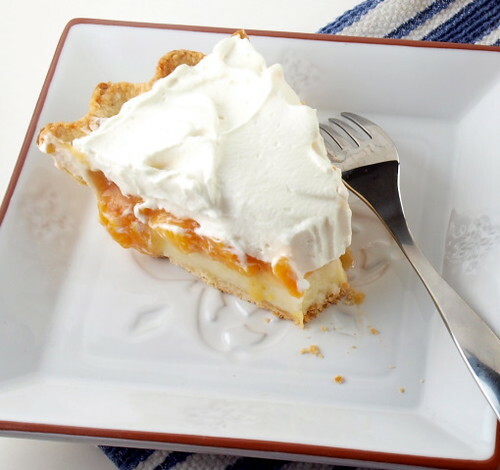 Peach Cream Pie takes a little time to make, but trust me when I say it is worth it! 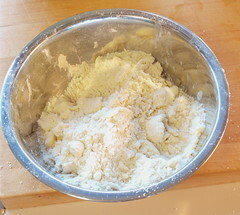 In a medium bowl whisk together the flour, sugar, and salt. Add the cubed butter and, with your fingers or a pastry blender, rub the butter into the flour until the mixture looks like coarse sand with some pea sized pieces of butter mixed in. Add two tablespoons of cold water and mix with your hands until the dough forms a shaggy ball. If the dough seems too dry add an additional tablespoon of water. Knead the dough five times by pressing the dough out gently, folding the dough in half and repeating. Wrap in plastic and chill for one hour. Once the dough is chilled roll it out on a well floured surface until the dough is 2″ wider than the 9″ pie plate. 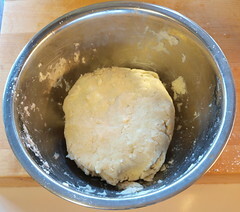 Line the inside of the pie pan with the dough, making sure not to pull or stretch the dough in the pan. 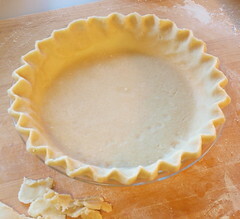 Trim off any excess leaving a 1″ border of dough hanging over the outside of the pie pan. Gently tuck the dough under, making the edge of the dough even with the edge of the pie pan, then flute the dough with your fingers. Cover the dough loosely with plastic wrap and chill the prepared crust for at least one hour. Once chilled dock the crust with a fork on the bottom and sides, line the shell with foil, and fill with baking beans or pie weights. Bake the crust with weights for 12 minutes. Remove the foil and weights and return the crust to the oven for 10 to 12 minutes, or until golden brown all over. Cool completely before filling. For the custard, in a saucepan whisk together the milk, sugar, cornstarch, and egg until well mixed. Cook this mixture over medium heat, whisking constantly, until it comes to a boil and thickens. 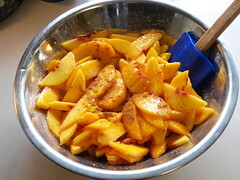 Remove from the heat and add the vanilla and butter. 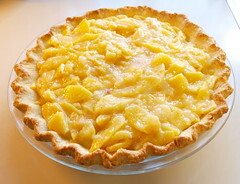 Pour the custard through a strainer then pour the custard into the cooled pie crust. 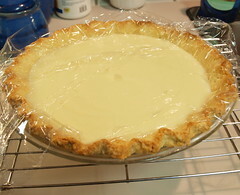 Place some plastic wrap directly on the custard while it is hot and refrigerate until completely chilled, at least three hours. In the bowl of a stand mixer add the cream, powdered sugar, and vanilla. Whip on medium-high speed until it starts to thicken. Slowly pour in the gelatin and whip until the cream forms medium peaks. 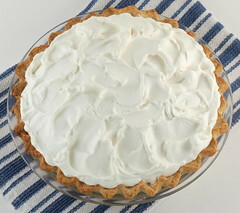 Spread the whipped cream on the pie and then chill for at least one hour.